And the cast of the series. "This is Edison Carter, coming to you very much live and direct on Network 23." Back in the 1980s, it looked like computers were going to be able to do just about anything. It also looked like Japanese businessmen were going to economically conquer the world. And it looked like corporate greed was going to grow and grow until the average citizen was a virtual slave to the mega-corporations who would happily destroy the environment, culture, history, and basic human liberty all in the name of profit. Come to think of it, not much has changed and those things look more likely to happen now than back in the 1980s (only with China instead of Japan). Max Headroom, a plastic-coated stammering faux-CGI host full of sardonic wit played by the frankly underrated Canadian actor Matt Frewer, made his debut in April of 1985 in a British one hour pilot entitled Max Headroom: 20 Minutes into the Future. Though Max was the star of the show, he was really a very minor character. The story followed Intrepid Reporter Edison Carter (also Frewer) and his "controller" (i.e. director) Theora (Amanda Pays, who later played fanfic-favorite Phoebe Green on The X-Files) as he attempted to uncover a conspiracy revolving around the Blipvert, a highly compressed advertisement his station had recently adopted, which had the unfortunate side effect of causing some viewers to explode. In his daring escape from security with orders to kill, he is gravely injured when he crashes his motorcycle into a gatepost. A totally unlikable Teen Genius generates an AI copy of Carter's mind to cover up his disappearance, but the copy is somewhat unstable and has a bad stammer. He takes his name from the last thing Edison had seen before his injury: a sign on the gatepost reading "MAX HEADROOM: 2.3 METERS". *BZZZZZZZZZT* Er, we apologize about that . Moving on. 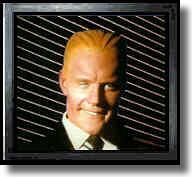 Max Headroom was a huge hit, especially in the UK. But it was in the US that the pilot was picked up. Sort of. 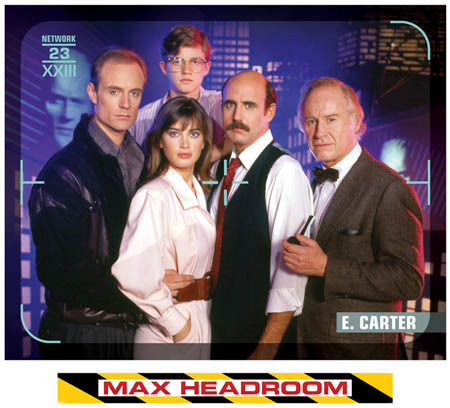 It was remade by Lorimar in 1987 as the first episode of the Max Headroom TV series, keeping only Frewer, Pays, and Morgan Sheppard (Blank Reg) from the original cast, and substantially rewriting the second half of the movie (but using all the video effects so the money budgeted to effects could be used elsewhere). The Teen Genius was changed from a villain to an unwitting patsy, and Max's role was greatly increased; in the original, Max and Edison never met, and Max spent the rest of the movie as a VJ for a pirate TV station. In the series, he and Edison became partners, breaking the Blipvert story together. Max Headroom straddled the line between Black Comedy and (mostly) serious Cyber Punk for two half-seasons before being cancelled and largely forgotten. Many believe the network intentionally killed it, scheduling it opposite two hugely popular shows, Dallas and Miami Vice (where, ironically, Matt Frewer played a villain in a two-parter shortly after his show was cancelled). The world presented by the show was strange and unwieldy, full of corporate greed, corrupt politics (elections to all political offices were decided by TV ratings: each network backed a candidate, and the highest rated network at the close of polling got their man installed), and a legal system that could not possibly have worked (it was illegal to turn a television off, books were banned in order to disenfranchise those who couldn't afford pay-per-view educational TV, bloodsports were mainstream, and trials for all but the rich and powerful were carried out in game show format). Also, everything had silly sci-fi names: "Blipverts", "Baby Grobags", "Credit Tubes", "Neurostim", etc. The character was resurrected in 2008 as part of Channel Four's marketing for the digital switchover, in a number of (full-length) adverts . In 2010, it was announced that the US series would be getting a DVD release in August of that year, with an amusing lenticular cover. The DVD set includes a bonus disc with behind-the-scenes featurettes. Episode recaps can be seen here. 23: Max is on Network 23, and takes his name from a warning sign saying MAX HEADROOM 2.3 METRES. Max: And I'll-I'll-I'll be back in a few moments with more from Network 23. Advert-Overloaded Future: The very premise of the series. Almost Kiss: At the end of Blanks. Ambiguously Gay: The usher issuing tickets to human guinea pigs in Dream Thieves is this in spades. Apologetic Attacker: Mel is this in Body Banks when he kidnaps Theora to force a conversation with Edison to happen. Cheviot: "Credit fraud?! My God, that's worse than murder!" Auto-Tune: Matt Frewer's voice gets electronically distorted whenever he's playing Max. Big Brother Is Watching: Insofar as the Networks have effectively become the government, Edison could often use the threat of his camera on uncooperative leads. The protagonists often exploit ubiquitous surveillance to learn things their superiors want to remain hidden. Black Comedy: Throughout the series. Breughel: I love babies. They're very sweet...especially with pickles. Brain Uploading: How Max was created. The process was less than perfect, and Bryce only allocated enough of 23's system memory to simulate the head and shoulders. Max stutters because the 23 mainframe's video memory bus wasn't QUITE fast enough to generate the 3D image frames of Max in real time ("it takes a moment to read out the frame store"). In later episodes the "Max Headroom process" is brought up as a potential method of saving the life of a terminally ill billionaire, as well as letting those visiting graves talk to their departed loved ones via a "Max" type image in the headstone. Break the Cutie: In Dream Thieves: During an assignment, Edison runs into Paddy, an old friend and colleague who lost nearly everything thanks to Edison breaking a story before him. While he feels guilty about it, Edison fully breaks that night when after reconciling with Paddy, he later finds him dead and goes on a hunt to find out why. He ultimately beats up a defenseless doctor live on-air and has to be given a What the Hell, Hero? speech by his producer Murray. By this point, Edison isn't so much angry about Paddy being dead, more that they only killed him so they could sell his dreams onto a subscriber network for a new show. Cassette Futurism: The TV movie and subsequent series. Even though it's the Trope Namer for 20 Minutes into the Future, there's no flat-screen digital HDTV, no internet, computer graphics have a distinctly pre-Windows appearance and TV shows are still recorded on tape. Church of Happyology: VU-Age Church has qualities like this as well as televangelism and cryonics. They claim to be able to use technology to Brain Upload a parishioner's consciousness and then transfer it to a newly cloned body. It is, of course, an enormous scam. Computerized Judicial System: With floppy disks! Corrupt Corporate Executive: Ned Grossberg. Many of the other network executives have their moments as well. Corrupt Church: The VU-Age Church exists for the purposes of bilking parishioners of their fortunes when they die. Crapsack World: Let's put it this way: Instead of foodstamps, the government gives the needy free TV sets. And only because the TV is used mainly for population control. Cyber Punk: One of the first television shows to apply this trope. Ditzy Genius: Bryce Lynch. The most prominent example being when Grossberg says (over Carter's unconscious body) that they need to know how much Carter knows about the adverse effects of Blipverts; Bryce suggests they ask him when he wakes up. Also when Grossberg mentions that it would be unfortunate if the public discovered that the Blipverts were making people explode, Bryce suggests they don't tell them. Engaging Conversation: Notable in that it's the woman who pulls out the "marry me!" gag. Even Evil Has Standards: Grossberg, on stealing babies: "Carter, you've got to believe me. What you speak of is even beyond me!" Everything Is Online: The way the internet in this show was shown to work, one could very well hack into a tree if they wanted. Faux Affably Evil: Croyd Hawser in Wars initially presents himself to Edison as a friendly figure who doesn't want to harm civilians, despite being the leader of a terrorist organization. It doesn't take him long to go Axe-Crazy and start initiating fatal attacks once Edison realizes he's been duped. Flanderization: A vague-but-important UK-Japan business deal in the original TV movie balloons into Japan Takes Over the World in the TV series. Genre Savvy: Most of the characters have their moments. in Baby Growbags, Edison and Theora both assume correctly that the fact Edison was given free access into another network must mean it's a trap, especially since said network is run by Edison's old boss Grossberg. It doesn't stop Edison though from going straight into it anyway for much needed answers. Gladiator Games: In "Rakers" Carter investigates the rise of the violent sport of raking, which involves skateboard riders with weapons fighting each other. The Guards Must Be Crazy: Max certainly thinks so . Hollywood Hacking: Complete with Rapid-Fire Typing and a Shout-Out to William Gibson with the term "ICE" (Intrusion Countermeasures Electronics). Honest Corporate Executive: A Downplayed Trope version with Ben Cheviot, verging on a Downplayed Trope of Corrupt Corporate Executive. Generally, Cheviot acts in the defense of the protagonists but he has a responsibility to the network and his sponsors who are exceedingly corrupt. As such, he mostly serves as a defense and middle-man between the cyberpunk future's worst aspects and our heroes. Hot Librarian: Theora is both smart and beautiful. Human Resources: Breughel and Mahler's primary source of income is disposing of corpses for other criminals by selling them to body banks, which harvest the organs for use as transplants. I Can't Believe It's Not Heroin! : The episodes "Whakets" and "Neurostim" feature a game show that broadcasts an addictive subliminal signal and a bracelet that implants images of a perfect life (and the urge to buy everything to make that perfect life a reality) into wearers' heads, respectively. Instant A.I. : Just Add Water! : Insufficient resources are mentioned in the episode "Deities" to be the reason that the Vu-Age Church's Brain Uploading process only created an "idiot version" of the deceased that could only respond to people in a pre-programmed manner, whereas the system resources of Network 23's mainframe made Max Headroom, a complete artificial intelligence, possible. Interchangeable Asian Cultures: For whatever reason, the often-featured executive of the Japanese Zik-Zak corporation is Ped Xing, a Chinese man — presumably so they could work in the joke.note Compounding this is that Xing himself was never played by a Chinese actor, but a Filipino one (Arsenio Trinidad) in the first season and a Japanese actor (Sab Shimono) in the second. Intrepid Reporter: Edison Carter (and theoretically, Max himself). Lantern Jaw of Justice: Both Edison and Max, but the "of justice" part usually only applies to Edison, since Max generally prefers snark and mischief over heroism. Low Clearance: According to the movie, this is where Max Headroom's name came from—the last words seen by Edison Carter before getting clocked by the sign. Mission Control: Theora, and occasionally Murray. Mythology Gag: In the TV series, as Blank Reg is watching Max's telecast he notes: "What I could do with one of him." In the original movie, Max ended up at Big Time Television. New Old Flame: Vanna Smith in "Deities" is Edison Carter's girlfriend from college. Only in It for the Money: Breughel and Mahler are more than willing to turn on their employers if someone else makes them a better offer. Percussive Maintenance: On a coffee maker, no less! Product Placement: Max inadvertently plugs non-branded auto parts . Max: Who's calling the tu-tu-tuneup? Who's in cru-cru-cru-cruise control here? I'll tell you who: Me! Me! Max Headlamp! Reasonable Authority Figure: As president of Network 23, Ben Cheviot's top priorities are always increasing ratings and trying not to antagonize Zik Zak, their biggest sponsor. However, he does have a moral compass, and he's a tough but fair boss to Edison and Murray, which is a vast improvement over his predecessor, Corrupt Corporate Executive Ned Grossberg. Repetitive Audio Glitch: Max often repeats syllables and words he's spoken within the past three seconds. Schizo Tech: Trope Namer for 20 Minutes into the Future, but the cars are all from The '50s. And whenever a computer keyboard was shown, it was actually the keyboard from an antique manual typewriter. Shout-Out: Infamously, the series received a truly bizarre one when an unknown hacker took over TV signals in Chicago and broadcast a rambling string of nonsense while wearing a Headroom mask. Read about that here . Soul Fragment: Edison's relation to Max. Suspiciously Similar Substitute: Rick Ducommun wasn't able to reprise his role as Mahler for the second season, so the writers replaced him with another character, justifying the swap by having Breughel kill the original Mahler offscreen during a slow business night, selling his corpse off, and naming his new partner "Mahler" as a mocking tribute. In the TV series, Bryce is an unusually likable example of this trope in large part because of the fact that he was depicted as a normal 15-year-old boy in terms of his personality, maturity, and sense of humour who happened to be a genius. The TV movie Bryce, on the other hand, is more irritating than Wesley Crusher and Adric combined. And, you know, evil. The City: With a small dose of Where the Hell Is Springfield?? Both American and British accents are ubiquitous and it's ambiguous what continent the series takes place in. Word of God is that it is a post-apocalypse dystopian Los Angeles. This can actually be confirmed in The Blanks when we get a view of the skyline. The Terrorists Who Don't Do Anything: Deconstructed in the episode "War" where the organization White Brigade has struck a deal with a news reporter: they blow up abandoned buildings, and tell the reporter beforehand. The terrorists get publicity for their cause, and the reporter can break the news about the "terrorist strikes" before the competition without anyone actually dying. Everyone wins. Subverted in the end, as the White Brigade decides to start targeting populated places after all. Those Two Bad Guys: Breughel and Mahler. 20 Minutes into the Future: Trope Namer — appears onscreen at the start of the movie and every TV episode. In the TV series, Bryce Lynch was born in 1988, and Chris Young was 16 when he played him, so the setting can be pinned down to the year 2004. Give or take a couple of years. Bryce's age is never mentioned on the show, and characters aren't necessarily the same age as the actors who play them. "The thing that even now gave them [the members of the board] a feeling of discomfort was that the face staring back at them was that of a boy of sixteen." Video Phone: Featured several times on the show. It is The Future, after all. Virtual Celebrity: Take a wild guess. Voice with an Internet Connection: Probably the Trope Codifier in its "with Internet" form. When the show was made, AOL was brand new, CompuServe was hip and hot, college students were just starting to get email addresses, and the Web was still years away. Nevertheless, Theora and the other controllers clearly are accessing something Internet-like and providing the info to Edison et. al. This was terribly prescient at the time, but now suffers from "Seinfeld" Is Unfunny. What Is This Thing You Call "Love"? : How Max is able to get Security Systems' A-7 computer to turn against the corporation and help Edison. What Measure Is a Non-Human? : "For God's sake, treat A-7 with some respect-spect! She's not just a machiiiiiiine...!" White-Dwarf Starlet: Max himself is humorously treated as one during Channel 4's digital switchover ads, constantly bemoaning how he was Screwed by the Network and trying to talk to his handler in the retirement home he lives in about his Glory Days in the 80s. Wicked Cultured: Breughel has a predilection for quoting classical literature. Physician, heal thyself! (While looking at the corpse of a dead doctor).